Danny Chambers swore to uphold the US constitution when he was elected to office. 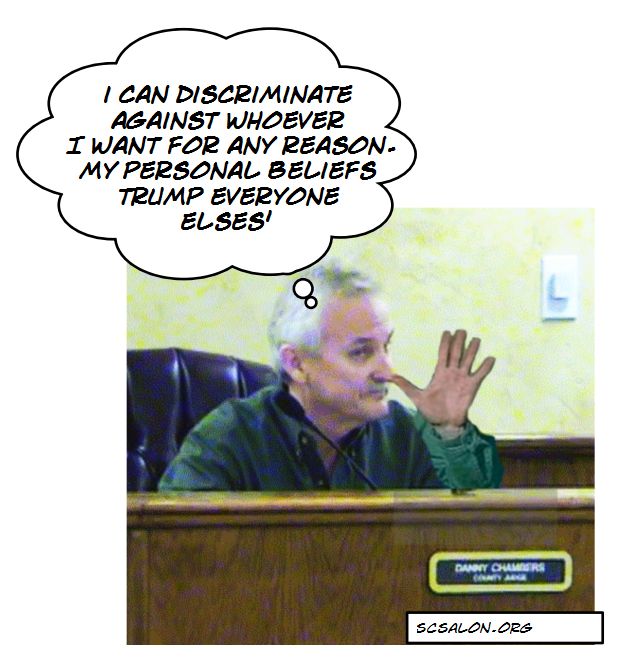 And yet, he continues to flout the "establishment of religion" clause by having one of the Somervell County commissioners open the meeting with a prayer directed TO the meeting participants. Worse, he, for 2 months, actually did the right thing by inviting the community to do the invocation, EXCEPT that he wanted to be discriminatory to ME, so stopped doing that. He is dead wrong, what he is doing is discriminatory, and unconstitutional. At the meeting yesterday, 9/12/2016, Somervell County Judge Danny Chambers continued to, as a pattern, have a county commissioner, Larry Hulsey, do the invocation. You know, after that particular meeting, Danny Chambers passed by me on his way out and said "Good Luck" to me. I was actually puzzled about why he would say that, since I had had no conversation with him nor knew of anything on that particular agenda that involved me. When I got home, I saw, in my email, that FFRF had sent a fax to Andy Lucas the day before, so I'm guessing that's why Chambers said that to me (if not, who knows? I sure can't read minds!) If I'm right, I guess he wanted to be sarcastic towards me. @anonymous. You are certainly misinformed. The comments on my Facebook group Somervell County Salon are not turned off. In fact, any group I belong to, anything I have posted does not have comments turned off. Perhaps you should check your facts before you go into an ill-informed rant. Now, I do have commenting rules on this page, which I assume you have read. And I also assume that you, as an American, believe that others who do not share your views still have a right to express them. You simply do not have a right to express, on this blog, whatever the heck you want, but you can certainly express yourself in your own venue. If you don't like my opinions which I, as a woman, express under the name "Salon", you can read elsewhere, no one forces you here. Incidentally, speaking of possible minority viewpoints, that are characterized as minority viewpoints without the benefit of proven data, perhaps you would benefit from reading the secular invocation that I presented at City of Glen Rose last night. I have always thought that religion, in its many forms, should be honored within our civil governance as directed by the Constitution. As in; nada. bumpkus, zilch. The founders, well aware of the divisiveness of religion, steered clear of it. So let's give religion its due as directed by our Constitution. As in; nada. bumpkus, zilch. Congratulations in your success with the City Council and your continued efforts with the Commisssioners' Court. Eventually, a sane person in Somerville County will realize that Mr. Chambers personal crusade to win indulgences with his god at taxpayer expence isn't a good use of public funds. @Charlie. Thank you. I prefer secular government meetings, no doubt about it, but local government does have the right, according to the Supreme Court Town of Greece v Galloway, to have invocations, as long as they are inclusive of EVERYONE being able to do the invocation, including non-believers. Chambers apparently has his own opinion of what an invocation actually should be and who can do one. I do partially give him credit for doing the right thing by initially getting rid of the commissioners doing the prayer, but then he changed his mind in order to discriminate against me and it's clear that's what he was doing.